I think it fitting to introduce my research with the mantra of our Mars Surface Environments research cluster at Aberystwyth University. It seems as though a long time has passed since Darwin’s prose were written, however, I do not think that the desire he was referring to has ever been greater. Having viewed with orbiters, traversed with rovers and, in the case of the Moon, set foot on other planetary/lunar surfaces we are in an age where we now dream of one day living on them (terraforming). Whilst I do not go that far in my research, I do spend my time studying the inspirational landscapes of Mars. 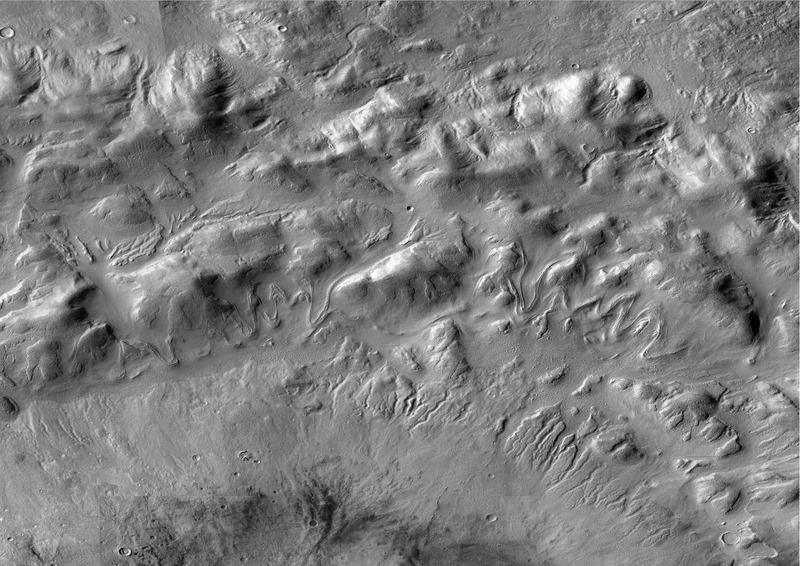 My PhD research is concerned with understanding a set of landforms in the mid-latitudes (30o – 60o N and S) of Mars which appear visually similar to valley glaciers on Earth. In sort I study glaciers on Mars (hence the blogs name! )…..well at present and more precisely, I study glacial-like forms on Mars. My main supervisor is Prof. Bryn Hubbard and my secondary supervisor is Prof. Alun Hubbard. Along with the Hubbard’s I also collaborate closely with a recent PhD student Colin Souness. To lend a term I recently discovered from a blog I read ‘tl;dr‘, so here goes. A set of distinctive landforms have been identified in the mid-latitudes of Mars, the origins of which have been described as glacial. Whilst early evidence suggests that these features are made of relatively pure water ice, there is still little know about how these features were created, what they are made of and how / if they move(d). By combining high resolution imagery, radar profiles and numeric models I am aiming to answer some of these fundamental questions. Mars is currently a cold and dry planet, with a thin maritan atmosphere providing poor insulation for the Sun’s radiation. Such conditions are unfavourable for the formation, and importantly, the preservation of water ice outside of the polar regions for long periods of time, where ice would simply sublimate away. 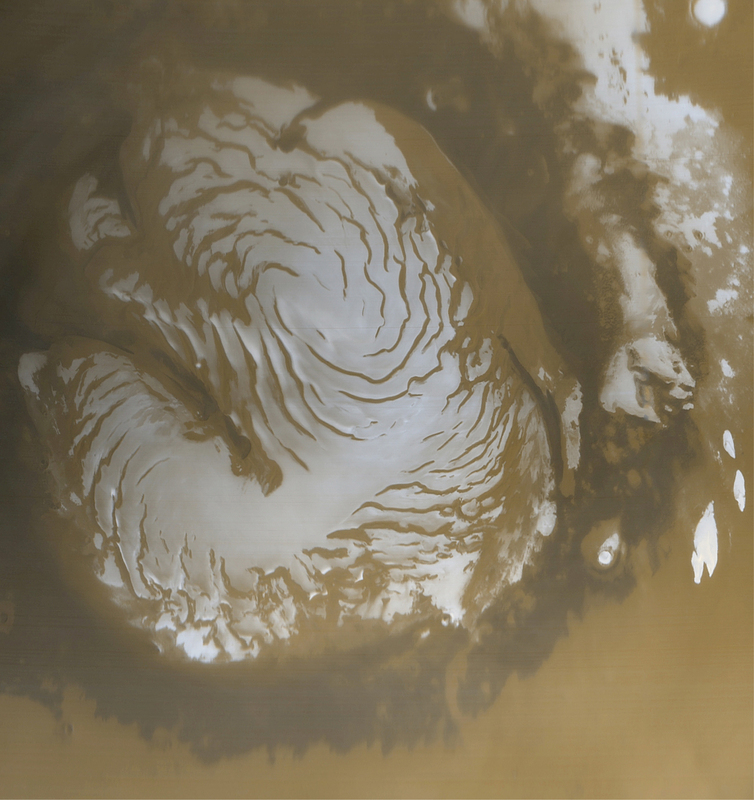 However, at present both the south and north polar regions of Mars are covered in a permanent cap of ice, similar to what we see on Antarctica today. At the extremities of the planet, environmental conditions allow ice to form and persist all year around. Interestingly, and in contrast to Earth, the composition of polar ice on Mars is not only water ice (H2O) but also carbon dioxide ice (CO2). CO2 ice can form as the temperatures at the polar regions of Mars are so cold that it can precipitate out of the atmosphere. Similar to Earth, the size of the polar caps fluctuate with the seasons on Mars. The north polar cap of Mars. A satellite image taken by the Mars Orbiter Camera on board the Mars Global Surveyor (Image: NASA/JPL/Malin Space Science Systems). Outside of the polar regions ice cannot exists on the surface of Mars for extended periods of time. However, a wide variety of landforms have been identified, spanning regions from the equator to the high-latitudes of Mars, which invoke ice as their main composition. 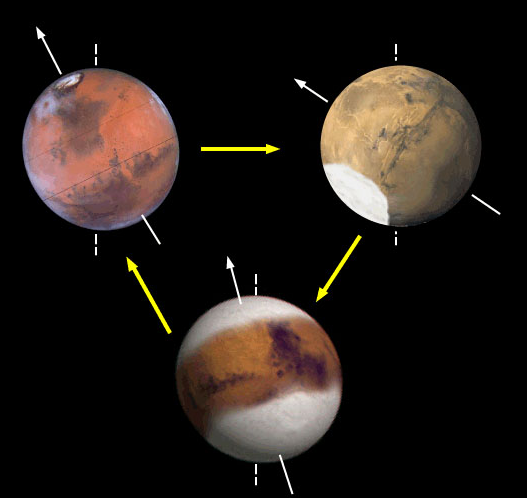 One particular set of features have been shown to be ubiquitous in the mid-latitudes of Mars (30o – 60o N and S). The appearance of these landforms has drawn much comparison with glacial systems on Earth, as they are shown to exhibit down-slope flow and deformation. Early suggestions from SHAllow RADar (SHARAD) on board the Mars Reconnaissance Orbiter (MRO) has also suggested that these features are made of water ice, further enhancing their glacial interpretation. Such observations have led to these landforms being termed viscous flow features. Viscous flow features (VFFs) in a crater on Mars. A composite collection of Context Camera (CTX) images taken form the Mars Reconnaissance Orbiter showing glacierised crater Greg (centred -38.65 N; 112.98 E). A large number of VFFs can be seen running along the centre of the image. (Image made using the free GIS viewer, JMARS). 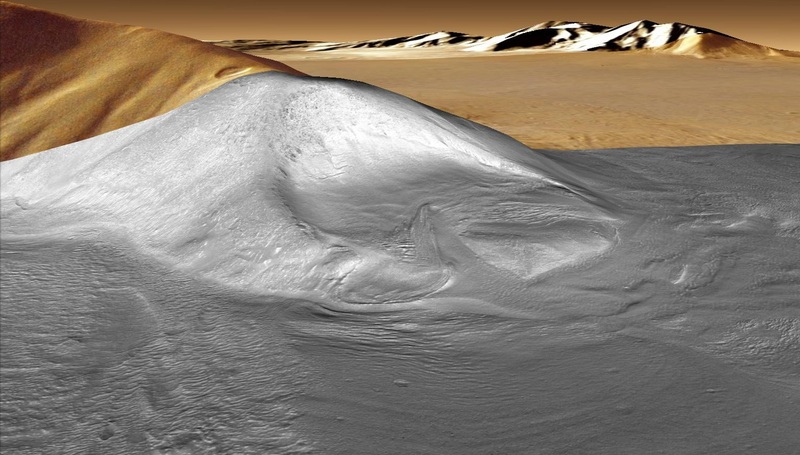 So, if ice cannot exist outside of the polar regions why do we see ice related landforms across Mars’ surface? Much like on Earth, Mars is not stationary and its orbital parameters change periodically. Over time, changes in Mars’ orbit mean that more or less energy is received at the polar regions, and it is hypothesised that when more energy is received in the polar regions, Mars may experience an ice age! In particular the obliquity of Mars (the angle of tilt on the axis of rotation) is thought to be the key control and it is when obliquity exceeds 30° that ice can be found outside of the polar regions. These orbital changes and their environmental alteration are much akin to Milankovitch Cycles, which many believe are an important control on the Earth’s climate. How a change in obliquity can affect the distribution of ice on the martian surface (Image: NASA/JPL). One particular sub-type of viscous flow feature has gained much attention in recent scientific literature. Their appearance has visually and contextually been compared to valley glaciers on Earth, and they have become known as glacier-like forms. Glacier-like forms appear to converge from cirque-like alcoves or valleys, move material in a downslope direction, and then merge with the surrounding topography, commonly forming an elongate tongue with raised moraine-like ridges. Glacier-like forms show a preference for mid-latitude locations on Mars where over 1,300 glacier-like forms have been identified. Whilst glacier-like forms appear to be an important landform in Mars’ mid-latitudes extremely little is known about them. In particular how these features were created, what they are made of and how / if they move(d). Example of a well formed glacier-like form draped over a Google Earth ™ digital elevation model. Here the glacier-like form tongue can be seen to sprawl out over a amphitheater-like valley. This particular glacial-like form shows many similarities to a glacial cirque on Earth (Image: NASA/JPL/Arizona). This is where my research comes in. With the location and morphometry (the process of measuring the shape and dimensions of a landform) of glacier-like forms known, I will be taking a closer look at the physical properties of glacier-like forms in order to decipher their dynamic behaviour. I will initially be focusing on two main aspects: 1) the physical glaciology of glacier-like forms; and 2) reconstructing their former extents. 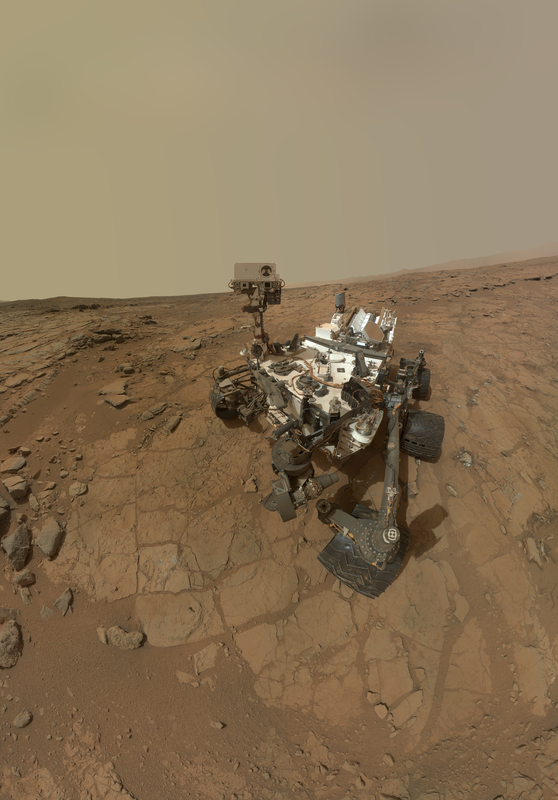 This will in the large part be done through the use of high resolution images taken of the surface of Mars. In particular I will be using the wider angle ConTeXt Camera (CTX) which has a resolution of ~6 m per pixel, and the High Resolution Imaging Science Experiment (HiRISE) camera which has a resolution of ~o.3 m per pixel. For comparison, in CTX images you would be able to see things such as your house, whilst in HiRISE images you could easily make out things such as a table. The power of the High Resolution Imaging Science Experiment (HiRISE) camera . Close up of the surface of a glacier-like form, showing how individual boulders (~5 m length) can be identified (Image: NASA/JPL/Arizona). Firstly, I will be looking for information which can help us interpret what glacial-like forms are made of and indicators of how they behave. For example, are glacier-like forms made of ice or an ice dust mixture? Do glacier-like forms show evidence for motion? This is important as at present there is scant information available which eludes to how such features were formed, how fast they move(d), or if such features are indeed made of water ice! Secondly, I will be looking at the possibility that glacier-like forms once covered a wider part of the martian surface. On Earth a branch of study called geomorphology looks specifically at landforms and how they were made/processes which created them. If, like their Earth based analogues, glacial-like forms leave behind evidence of a past extent it may be possible to reconstruct their former position. One particular feature which is used heavily in Earth based reconstruction are moraines, and similar features have already been identified on the martian surface. It is hoped (and I use that heavily here as it is only early days of the PhD) that I will subsequently be able to use a high-order three-dimensional model, calibrated with the information elucidated above, to model the flow of glacier-like forms. What is the point of it all I hear you ask? Well by answering some of the above question I hope to be able to improve our understanding of: 1) how climate has changed on Mars in the past; 2) how glacier-like forms originate and change over time; 3) if glacier-like forms have ever been active surface altering agents on Mars; and 4) if glacier-like forms could have ever contributed substantial liquid water to the surface of Mars. Furthermore, on a wider scale, if glacial-like forms are composed of water ice they would be: 1) ideal localities conductive to and for the preservation of microbial life; and 2) vast stores of water, making glacier-like forms potential candidate sites for future missions to Mars.